Equipment updates work hand in hand with premium-based crops. Del Unger and his son Lance are taking two tacks to make a profit this challenging year. One is to boost yields with better technology. The other is to take advantage of unexpected marketing opportunities. Most of the Ungers' farmland is in the Wabash River Valley, near Carlisle, Indiana. Their soils vary from light sand to heavy clay. They already use precision technology to apply fertilizer nutrients on these variable soils. TESTING DOUBLE 2 X 2. This spring, the Ungers took precision to another level by switching from applying starter fertilizer 2 x 2 (dropping fertilizer 2 inches to one side of the corn row and 2 inches below ground) to applying 2 x 2 x 2 (placing fertilizer on both sides of each corn row). "Our root digs last year found that corn plant root systems favored the side of the row where fertilizer was placed," says Del. "Farmers who've experimented with applying the same fertilizer rate per acre 2 x 2, but by applying 2 x 2 x 2, have told us they've seen equal root masses on both sides of each corn row and corn yield bumps of 5 to 7 bushels per acre." The father-son team is testing if they can generate these same kinds of results on their land by running side by side comparisons of 2 x 2 versus 2 x 2 x 2. Del plans to run the tests on different types of soils. "The 2 x 2 x 2 should especially benefit the performance on light, coarse soils," says Melanie Burk, area BASF Innovation Specialist. "If the comparison test shows good yield results for 2 x 2 x 2, we'll convert our other corn planter for next year," says Del. "The proof will be in the production." In their 2 x 2 application, the Ungers are applying 5 gallons per acre 28% UAN, 5 gallons per acre 10-34-0, 2 gallons per acre ammonium thiosulfate (ATS) with a quart per acre of zinc. In addition to the 2 x 2 starter application, the Ungers also apply a "pop-up" fertilizer application right on the row. "I think there's a big advantage to applying both starter and a pop-up just in the simple fact it gives us a point and a half dryer corn in the fall," says Del. "Also," he adds, "if you're going to push the envelope in planting dates, I think pop-up helps corn get established and up and going quicker." Del and Lance made their own planter modifications to plant 2 x 2 x 2. They bought a new John Deere 1770 planter last fall with a bar mounted 2 x 2 set up on the front of the planter. They then modified the planter, adding a coulter and starter tubing, to also apply fertilizer on both sides of the row. 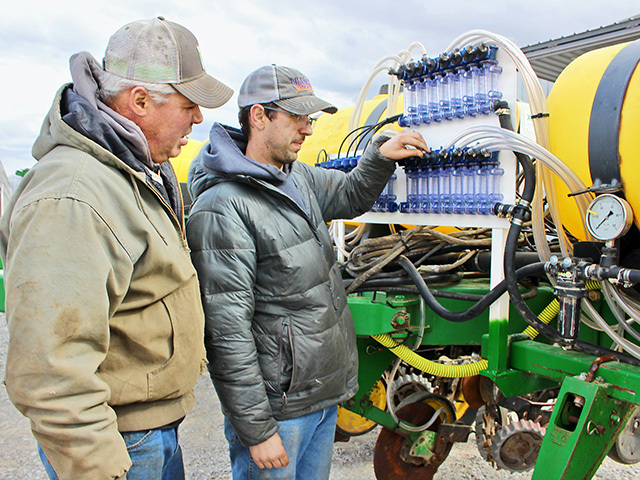 The work included removing the unit-mounted no-till off the back of the new planter adding in their places a 2 x 2 Martin single disk fertilizer opener and row cleanser on the back of the new planter on each row. Then, to monitor nutrient flow to both sides of each row, they mounted float ball flow indicators on the front of the planter. Over winter, the Ungers took advantage of two opportunities to boost 2018 crop price. One was an offer to grow identity preserved (IP) corn and soybeans. "We're growing some non-GMO beans," says Del. "IP crops are more work, but the premiums were very good." One-quarter of the Ungers 2018 crop production will be in some premium-based crop. The Ungers also took advantage of the late-winter corn and soybean price rally to lock in profitable prices for both corn and soybeans. "We can handle $11 per bushel beans, but not $8 per bushel beans, so we got pretty aggressive when the market popped in February and March," says Del.